Karolina Eklöw is a Research Assistant at the Stockholm International Peace Research Institute (SIPRI). She focuses on responses to climate-related security risks. Follow her on Twitter @KarolinaEklow. Florian Krampe, PhD, is a Researcher at the Stockholm International Peace Research Institute (SIPRI) where he works on climate security and sustaining peace. Follow him on Twitter @FlorianKrampe. 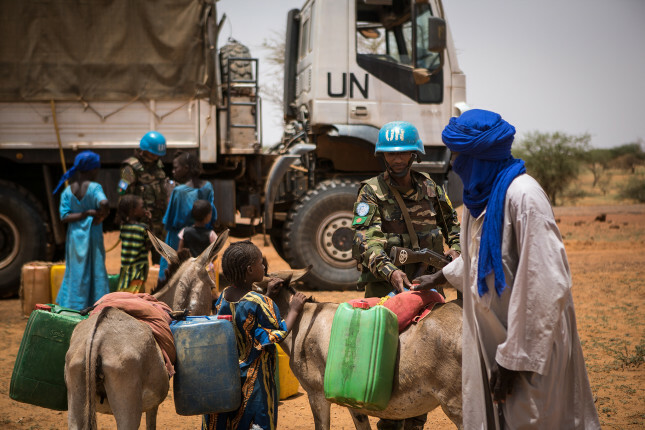 Often, peace operations’ and post-conflict states’ capacity to navigate the impacts of war and simultaneously manage natural resources is limited. But, an increasing body of research and policy experiences shows that in the long run it can be rewarding. Actually, natural resource management appears to be an important factor post-conflict states must consider if they wish to build a foundation for a socially, economically, and politically resilient peace. Yet, too often this potential remains overlooked in most peacebuilding processes. The case of Colombia illustrates the complexity and competing interests in post-conflict arenas. It is noteworthy that protests against socioeconomic injustices and privatization of land once sparked the longest lasting conflict in the Western Hemisphere. As such, it is no coincidence that the first chapter of the Colombian Peace Accord addresses issues of land use and rural reform. Environmental issues were a part of the problem. Some stress the Accord’s potential contribution to addressing environmental problems. Yet, today, two years after the end of the civil war, Colombia stands at a crossroad and the environment has moved into focus again. For half a century, Revolutionary Armed Forces of Colombia (FARC) ruled massive areas of land and jungle. By chance, the environment was protected from exploitation, as areas were not safe for loggers and miners to exploit. Today, these land masses are exposed and many actors flow into the previously inaccessible areas for logging, gold-mining and cattle-grazing. It is unclear whether Colombia’s resources will be carefully preserved or drastically exploited. For now, there is little doubt that deforestation has increased dramatically after the peace agreement. Hence, environmental protection seems to be a symbolic chapter of the Peace Accord rather than a reality. The issue of natural resources was once the epicenter of the Colombian conflict. If history repeats itself, the sustainability of the peace may be uncertain. Yet, while land issues often receive attention, few people are aware that peacebuilding missions often are directly involved in managing water and sanitation. Recent research into water supply issues in Kosovo and East Timor shows that in fact, many peacebuilding missions have dedicated units dealing with water supply as well as with foul and waste water. In East Timor, existing water infrastructure was poorly maintained and at times even targeted during the Indonesian occupation (1975–1999) and the ensuing violent transition towards independence in 1999. The resulting lack of access to safe water and adequate sanitation amplified the vulnerability of post-conflict communities and inevitably prolonged the human costs of war. For several months, the United Nations Transitional Administration in East Timor (UNTAET) had to airlift thousands of bottles of drinking water to the peacekeeping troops that were dispersed across the country. UNTAET faced many other challenges related to water sector reconstruction. The failure to involve women in local water user committees was one of the missed opportunities—especially considering that UNTAET had a specifically dedicated Gender Affairs Unit. In fact, in cases where women’s involvement was high, the Asian Development Bank notes that water supply is more likely to be continually available and closer to homes, thereby decreasing vulnerabilities and providing pathways for human security and development. Now if natural resources in peacebuilding are complicated, just imagine how climate change distracts from efforts to sustain peace. Without a doubt the adverse effects of climate change are going to further complicate this task. In fact, this is currently visible in Afghanistan and Iraq. The events of the 21st century have taken a toll on the people in Iraq. Following multiple wars, insurgencies, and decades of authoritarian rule and international sanctions, Iraq is today ranked 120th place in the latest Human Development Report. After 15 years of international peacebuilding efforts, Iraq remains home to poverty and severe trauma. As if these challenges are not big enough, in Iraq, climate change is making things even more complicated. Indeed, a recent report by the Expert Working Group on Climate-related Security Risks shows that climate-related security risks in Iraq have increased in recent years. The report highlights the rise of communal tensions over access to food and water that intersect with ethnic and tribal identities. Furthermore, the report notes that diminished agricultural livelihoods have helped increase local support for terrorist groups. Agriculture remains the key occupation for millions in Iraq. But while the petroleum industry is saturated with massive financial investment, the Ministry of Agriculture receives one of the smallest allocations from Iraq’s national budget. Following the U.S.-led invasion of Iraq in 2003 and the consequent peacebuilding mission, international efforts failed to restore relevant sectors that would make the country and its population more resilient to climate impacts. In turn, climate change and mismanagement of water resources make the livelihoods of millions of farmers uncertain. The resulting unemployment and vulnerability gives groups like the Islamic State an incentive to look for recruits among the disenfranchised. The experience of Colombia, East Timor, and Iraq suggest that building peace is rarely, if ever, straightforward. International efforts to build peace underwent substantial changes since the first missions following World War II. The UN Secretary General’s emphasis on conflict prevention and institutional reform of the peacebuilding infrastructure is an important pathway to learn from past failures and refocus and reinvigorate international peacebuilding efforts. Still, the management of natural resources is a critical challenge that remains overlooked. And things will get even more complicated with the increasing impacts of climate change. Recovery plans to sustain peace can no longer exclude the management of the environment, natural resources, and strengthening societies’ resilience to climate impacts. People need to recognize that bolstering environmental matters and sustaining ecosystems is a matter of conflict prevention. With the right support, factoring in environment and climate change may even be an opportunity to build a socially, economically, and politically resilient peace.